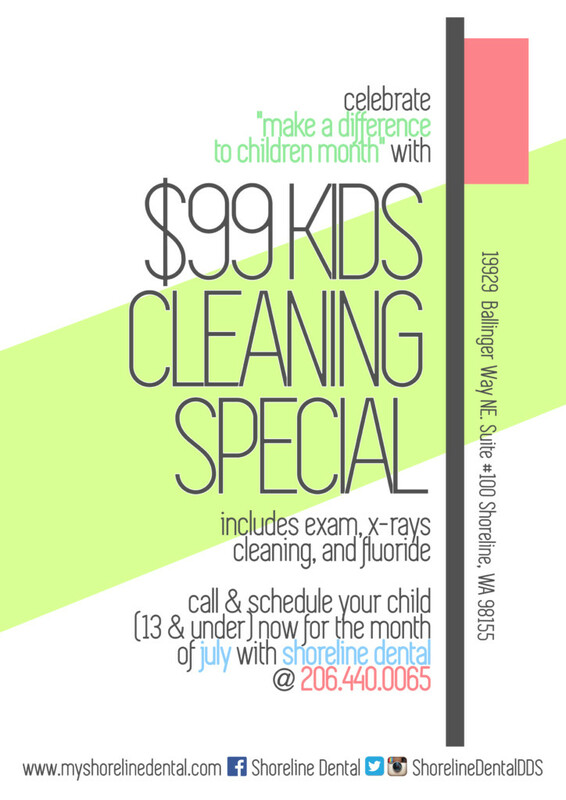 You heard right — all month long for the month of July, Shoreline Dental is doing a kids cleaning special promotion for children everywhere! July is National Make A Difference To Children Month and we want to celebrate here at Shoreline Dental. Children all around the world suffer from lack of food, health care, shelter, and resources. Even if it’s just a small difference, our team here wants to help. If dental care if inaccessible or a bit too pricey for you, let us help. We want children to value the importance of oral hygiene therefore we must 1. educate them and 2. help them practice. 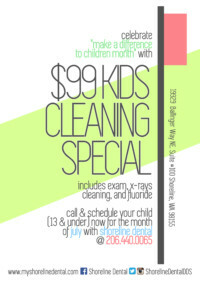 With that said, our gift to you is a $99 kids cleaning special that includes an exam, x-rays, cleaning, and fluoride! What better way than to start summer than with a bright smile!? To be eligible for this offer, kids must be under 13 years of age. Give us a call at 206.440.0065 if you have more questions or to schedule an appointment today!